Mr Walsh was asked by The Independent’s Simon Calder if he was disappointed with the Iberia joint venture. Clearly when IAG was created in 2011 the Spanish economy was far from bright and Iberia was not highly regarded in airline terms. He responded that he has no regrets and that the airline would be restructured reminding the crowded audience that British Airways staffing problems had been sorted out (in fact by Keith Williams, CEO after Mr Walsh’s elevation). Business Travel News enquired as to British Airways thoughts on the future of Heathrow. Mr Walsh reconfirmed that he was happy with the two-runway operation and that the scenario would remain in place “for the next 50 years”. 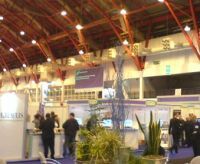 This was the penultimate Business Travel Show at Earls Court 2. In 2015 it moves back to Olympia and a larger hall. 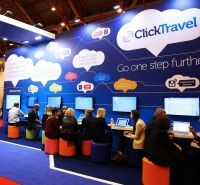 The timing is probably perfect with the 17,000sq m venue virtually full, occupied by the business travel community, and two other closely related exhibitions, Travel Technology Europe and new for this year Hospitality Technology Expo. All under the Centaur Media Group Plc banner. Now a busy two-day event (in times past it was three), this year’s show was universally accepted as a big success, and busy right up to the doors finally closed at 17:00 last Wednesday afternoon. Some 6,000 plus buyers attended and there was a fine programme of nearly 50 lectures and briefings at the two presentation theatres. 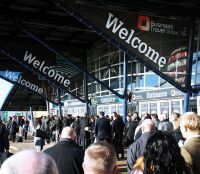 Exhibitor numbers were up by 6% on the previous year – from 197 to 205; and three quarters of exhibitors rebooked onsite for 2014 making this year’s event the most successful for more than five years. There were announcements galore and it is best to paraphrase with the airlines first and in alphabetical order, Mr Walsh reminding everyone of the efforts made by the London Chamber of Commerce with high level delegations last year to Brazil, China, India and shortly Qatar. 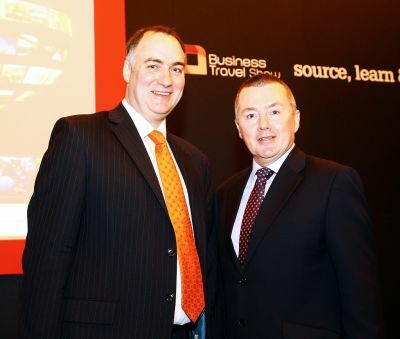 Success generates business for the UK economy, and of course business travel. On the airline front Aegean Airlines is to fly from Manchester to Athens twice weekly for the summer season. Air Astana, a Heathrow operator, is introducing flights from Almaty to Hong Kong and Astana to Beijing. Finnair was busy promoting Helsinki as a hub and new routes from June to Xi’an in China and the Vietnamese capital Hanoi. JAL showed off its Sky Suite new Business Class seat, a highly-private space with generous legroom, furnished with a fully flat bed with unobstructed aisle access for every seat and with a host of first class amenities and functionalities including innovative sleep gear from Weava Japan Inc; and fitted with a 23-inch personal TV screen, one of the largest in its class in the airline industry. Malaysia Airlines were in the Airline Pavilion, announcing their membership of oneworld from 1 February just passed, a very important step forward. Passenger benefits will include extended frequent flyer privileges for Malaysia Airlines’ Enrich loyalty programme members across partner airlines, which include American Airlines, BA and Qantas, and access to 550 airport lounges around the globe. Both Saudia and South African Airlines took prominent space and were promoting their services, something of a breakthrough for the Middle East carrier. Russian airline Transaero is adding two daily flights to its Moscow – London route (Vnukovo Airport) starting from April. Currently, the airline operates a Moscow daily service to Heathrow from both Domodedovo and Vnukovo. 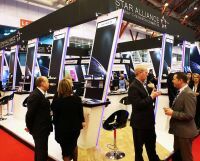 The London Star Alliance airlines once again featured with a large stand offering each carrier equal space, whilst Skyteam were prominent in the Business Lounge. Announcements came thick and fast as the show opened with Amadeus, sponsor of the Hosted Buyer Lounge reminding visitors of its recently published “Business Travel Insights Report” (see BTN 28 January). It charts the behaviour and aspirations of business travellers across the UK and is based on a survey of over 400 UK and Ireland adults, who work for large companies and regularly travel for business. Also launched was Amadeus Mobile Messenger (to cater to duty of care responsibilities). Deep Blue introduced its new ‘Flying Butler Service’ for business travellers, exclusively for guests staying at its serviced apartments in London and Greater London. Tailored to each client’s requirements, the service includes transfers from any London airport or train station; grocery deliveries; additional housekeeping and a dry cleaning service. BTS 2013 could also be said to be the year of apartment suites with the Association of Serviced Apartment Providers (ASAP) having their own pavilion. However, possibly stealing the show was Ascott, the largest operator of its type in Asia Pacific, Europe and the Gulf region with over 30,000 apartments under management. Launched was Citadines Suites, a new style of boutique serviced residences, with Citadines Suites Louvre Paris leading the way. This adds a third upper category of residence to the company’s existing Citadines Apart’hotel and Citadines Prestige labels in Europe. Egencia is a sister company of Expedia, focussing on business travel. 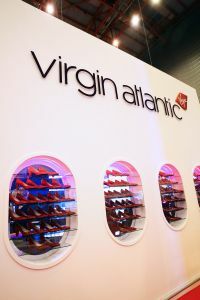 The Business Travel Show proved to be an ideal showcase for a company now wishing to be far more visible than in the past including a full corporate rebrand. Travelport, the business services provider, unveiled a new tool for agents which will enable them to significantly enhance the way they manage, mark-up and control the onward distribution of their airline filed private fares. The new tool automates the often complex, time consuming and manual processes they follow today.